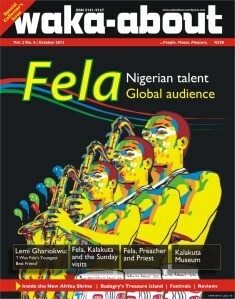 @waka_about editorial (Oct. 2012; print edition), published just before #Felabration 2012. Lemi Ghariokwu speaks of Fela in very adoring terms. The day I visit his studios on the Lagos Mainland for a chat, he takes me down memory lane to the year when he sketched his first portrait of Fela, when first met the late Afrobeat creator and his first commission to produce the artwork for Fela’s album jacket; he goes on to recount their subsequent working relationship, spanning the better part of three decades, and how glad he is that Fela is being celebrated the world over, 15 years after his death.